In 1892 James King established Cedardale Farm in the fertile fields of North Dumfries, between Kitchener and Cambridge, Ontario. Four generations later, King's great-grandson, Tim Barrie, farms Cedardale and operates Barrie's Asparagus Farm & Country Market. Tim's parents, David and Miriam Barrie, began growing asparagus at Cedardale in 1974 after harvesting seed from Miriam's family farm at Alliston, Ontario - at the time, her father, Homer McMann, had the largest asparagus farm in Ontario. In 1990, David & Miriam developed Namingazi Farm Training Centre in Malawi, Africa through Presbyterian mission work. Since 1995, Tim and his wife Libby have been blessed to call Cedardale Farm "home" raising their four children there. In every aspect of farming, Tim strives to honour his parents and grandfathers - their integrity, work ethic, and love for the land has shaped his values, beliefs and farming practices. When you visit Cedardale, ask Tim to show you one of his Grandpa Will Barrie's hand-carved wooden gavels or inquire about the "I.O.U." payment plan his Grandpa Homer McMann used in Alliston. Family traditions mean everything to the Barries and Tim & Libby hope you'll feel right at home at Cedardale Farm. Directions to Barrie's Asparagus Farm & Country Market are found here. 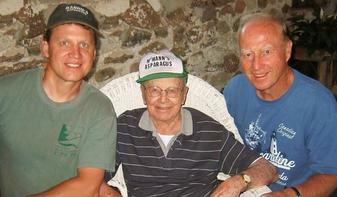 Tim Barrie with his grandfather, Homer McMann, and his father, David Barrie. At one time, Homer had the largest asparagus farm in Ontario. Barrie's Country Market is located in Tim and Libby's Century Farm House and is open daily, year round. 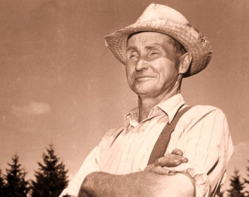 Will Barrie, member of the Agricultural Hall of Fame for his work establishing the International Plowing Match. Introducing a treat, inspired by Mom, or as many have called her, "Spud". and their daughter Miriam (our Mom). For years, Homer grew the best potatoes in Ontario, before launching the largest asparagus harvest this province had ever seen. as much as Spud does!